With pleasure I enclose a picture - appreciate the kind request - am happy to know the old L&H films have afforded you so much pleasure thru the years also seeing in person at the old Chiswick Empire - we too enjoyed our appearances there - a very happy memory. Re my visiting Italy recently, that news article was not me nor my daughter in the news photo - actually I have'nt been Abroad since I suffered my slight stroke in '55. The chap goes under the name of Joe laurel, & announces he is my Brother he is a night club entertainer - definitely is no relation to me whatsoever - I can never understand who would ever desire to look like ME.!! rather stupid do'nt you think?? Wish you'd mentioned your Sons name, would have liked to send him a picture too - if he would like to have one, just drop me a post card. Thanks your very nice letter 21st.inst. - indeed nice to hear from you. Regarding the article you mentioned you read that I was recently in Europe, I saw that news photo taken with the little girl, that was not me - nor my daughter - some chap posing as me - unfortunately due to a stroke I suffered in '55 I am definitely unable to travel, in fact I seldom go outdoors only occasionally to visit my Dr. Anyway this is not too important as I am now permanently retired, and pleased to tell you am Happy & Content. Yes, I was with Karno's 'Mumming Birds' your Father remembers seeing, that was around 1910 just before we sailed for the USA. I was Chaplin's understudy at that time, this recalls many happy memories. I have'nt seen or heard of Mrs Hardy for some time now, she incidentally remarried since Ollie passed on. Again thanks Graham for your kind sentiments so warmly expressed. Thanks Bob & Pat [Stowell] for the nice Card - appreciate very much the kind remembrance - not feeling too good (diabetic dept.) so please pardon my brief reply. Thanks yours [Rene Rondeau], 1st.inst. 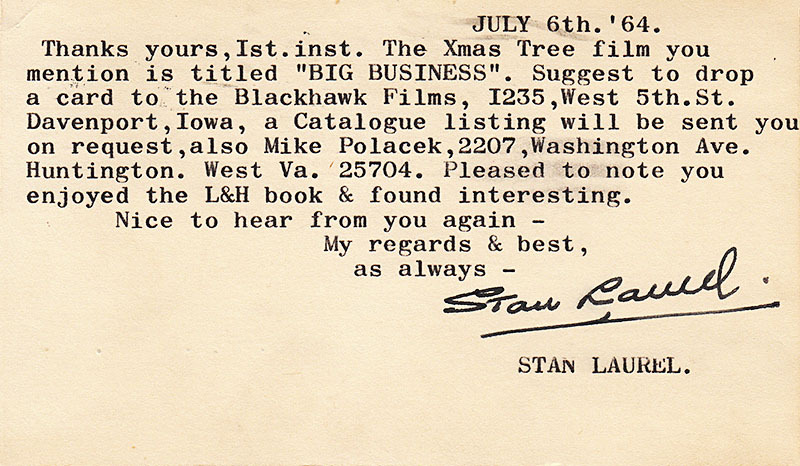 The Xmas Tree film you mention is titled "BIG BUSINESS". Suggest to drop a card to: the Blackhawk Films, 1235,West 5th.St. Davenport,Iowa, a Catalogue listing will be sent you on request, also Mike Polacek,2207,Washington Ave. Huntington. West Va. 25704. Pleased to note you enjoyed the L&H book & found interesting. Thanks Edmund [Tester],yours recd. this AM. Pleased to know alls well & appearing at the 'World's Fair' thats a pretty heavy schedule - so many shows, but am sure you are enjoying the engagement. Congrats. Due to my ill health situation Ed, would appreciate your not suggesting people stop by to visit with me - have too many now, its too much strain on me. Thanks anyway for the kind thought & gesture. Mrs L. joins in kindest & bestest to you all at 33. Edmund Tester lived at 33 Fairview Avenue, Oceanside, NY. Many thanks for the kind remembrance - appreciate very much the gracious sentiments so warmly expressed on my 74th. birthday. Danny Kaye and Jackie Gleason are the tops! thought you'd enjoy - recd. yours 26th.ult. Got a big kick out of Tommy Gibson's gag re the Castor oil - incidently, its possible your dog is troubled with "WORMS" not Piles - you should check on this right away Vic. The swelling dept. has finally gone away but am still bothered with the diabetic business - I finally decided to go into hospital for a thorough examination - am going in today - the cost of the room alone is $35. (Dollars) per day, so can only afford a few days - am hoping not more than a week - anyway, I thinks its best to find out. This 'Digitalis' I understand is very fine medicine - frankly do'nt know what it is but its sounds to me like an Indian Magician - "THE GREAT DIGITALIS" who eats a bale of hay without the aid of a toothpick.!! Can understand why the "Crazy Gang" are not on that TV program - the drawing of Charlie Naughton is terrific, I can imagine the reaction of the audience with this gag what the hell did he do for a finish??!! Not much else, Vic & Gladys - must get ready to leave for the hospital - will drop you card when I get back home - hope with good news. 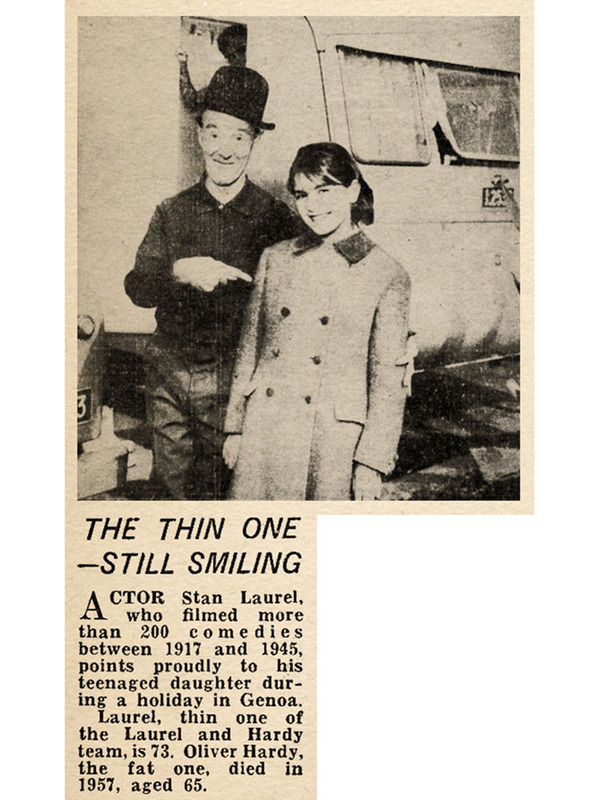 Stan Laurel, surviving member of the Laurel and Hardy comedy team, has entered West Valley Baptist Hospital in Encino for what his wife described Tuesday as a “checkup for an old diabetic condition.” Mrs. Laurel said she expected her 73-year-old husband to return to their Santa Monica beachfront apartment within “two or three days.” The English-born comedian has been a diabetic for 16 years. He suffered a stroke in 1955 from which he completely recovered. His partner, Oliver Hardy, died in 1957. Thanks Dean [Kaner] your card recd. this AM. Shall be pleased to see you on Monday afternoon - Aug. 3rd. around 2-30 PM. Am still quite weak, but improving. P.S. Sprained my wrist in hospital - hence no signature. Stan Laurel, 73, the surviving member of the all-time great comedy team of Laurel and Hardy, lies ill today in a hospital from a diabetic attack. He has been there since last Thursday—and no one is supposed to know about it. But somehow, 1,000 letters a day have come to the hospital from Laurel and Hardy aficionados. West Valley Baptist Hospital in nearby Encino won’t even admit that the English born comedian is a patient. “We have no one here by that name,” hospital attendants say tersely. But Laurel himself, via the close friend, leaked the word so that he could publicly thank the thousands who have written him. In their prime, Laurel and Hardy had a fan club in Europe that numbered more than two million members. There is no official word on Laurel'’s condition, since the hospital won’t talk. But the friend, an unimpeachable source, said Laurel’s wife expects to take him home to their Santa Monica beachfront apartment in a few days. Laurel has been a diabetic for 16 years. He suffered a stroke in 1955 but has completely recovered from that. “All I do is stay In the apartment and watch the ocean and television,” he told an interviewer a few years ago. Hollywood has forgotten Stan, but the world hasn’t. His living room is cluttered with fan letters from all over the world, even from remote countries in Africa and Asia. Laurel, until his attack, patiently answered all the fan mail and sent along a little photo of himself and Oliver Hardy, who died in 1951. Oldtime comedian Stan Laurel, 73, in Valley Doctors Hospital for a checkup on a longtime diabetic condition is reported in ‘good shape’ Thursday. He probably will return home today. Hospital officials said Laurel, who entered the hospital a little less than two weeks ago, had received ‘bushels of mail, mostly from kids,’ during his stay.